So, here it is--my plush alphabet magnet tutorial. This is a bit of a quick and dirty project--and I think it lends itself to inexactitude--so when I say things in the instructions like that you should cut 26 8x4 inch pieces of fabric--please, save your self the trouble and just eyeball it and cut the fabric out. Same with the cotton batting--eyeball and cut. Who's going to care if you the hole you cut out on the letter "O" is a little wonky? I won't--I mean, look at that hole on my own letter "O" above. This pot will not be calling any kettles black. I meant to make a little drawstring bag with an "ABC" applique on the front to store all the magnets in--but ran out of time since I had to leave for Washington DC for work yesterday...but I may just come back and edit this post later to include a little drawstring bag--but I'll have to get back to you on that one. 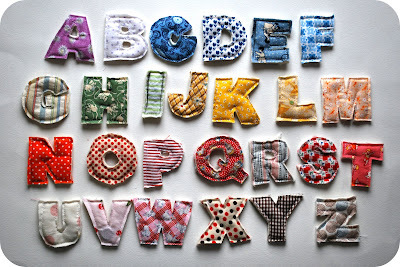 Now, go make some plush alphabet magnets for yourself or the kiddos in your life. Ooh thanks for this - what a great idea. I am definitely going to bookmark this for a future project. that's grat! and looks easy! thanks for sharing! thanks for the great idea! i am going to make some for my sons preschool and some as gifts! ps. you should enter your tutorial into the sew mama sew scrap contest...i think the prize is a gift card for fabric! Hey everyone. Thanks for all the gratitude. So glad you like it...makes making the tutorials worth it! this is really fantastic! you should enter it in the sewmamasew scrap buster contest! Hey Meg and Mama Monster: I did it! I submitted it to the scrap buster contest! Thanks for the idea. I'm totally doing making this. Dang, like I need another project! Dang you, Holly! Please don't do anything else cute or inspiring until I get caught up. Please! Wow, that is GORGEOUS! My favorite stash busting project so far, what a fun heirloom. Love, love, love! Thanks so much for sharing this, I'll be linking. Oh my! I'm so excited!! This will make the perfect Christmas gift for my niece!! I've had a hard time figuring out what to do for her - thanks for solving my dilema!! This makes my head hurt in a really good way. Love how you made your blog header with the letters. Darling!!! Hello, I just found you through oneprettything. This is a great tutorial, but PLEASE everyone be aware that magnets can be VERY dangerous for small children. If they swallow two the magnets can twist in their intestines and cause pain and injury. (reference http://www.webmd.com/parenting/news/20041026/swallowed-magnets-are-dangerous ) Obviously these magnets are sewn inside the fabric but I thought everyone should know. Thanks for the reminder to everyone--I actually have a warning inside the tutorial itself that you download about the danger of magnets and keeping these out of the hands of very small children who are inclined to put things in their mouths. This has got to be one of the cutest ideas I have ever seen! I absolutely LOVE it! Saw you on oneprettything! So glad I did, I will definitely be making some of these! I dont speak english,but .....worderfull!!!!! My goodness, this is the cutest idea ever! Thank you so much for the wonderful tutorial! I'll definitely be whipping some of these up for my little niece! This would be such a great gift for my nephews - thanks for posting this! LOVE the alphabet! I was just telling a friend about your cute blog banner! This is wonderful! My son will love these. adorable! This will be great for my son's reading lessons!! My daughter is too young for these right now but it's such a great idea that I'm going to make a set and save them away until she is a bit older! I am loving this idea! I'm going to make this soon for my 2-year-old. These are way cuter than the nasty plastic ones. I am going to make these for sure. Does the magnet stick to the fridge very well through all those layers or should it be in the back? Just curious. Also, what size of magnets did you use? The magnets stick great as long as you put the magnet just behind the one layer of fabric--do not sandwich it between the layers of batting (I tried this initially and they did not stick)--the instructions tell instruct you to place the magnet just beneath the layer of fabric in the back. The magnets I used were probably somewhere between 1/4 and 1/2 an inch (definitely not as big as half an inch though) in diameter. I bought mine at Michael's. Waaaay cuter than plastic alphabet letters! I really really love this idea! A perfect handmade Christmas item for my almost 2 and 3 year old nephew and niece. Thanks! Thank you so much for this tutorial!! It's exactly what I needed for a present for my nephew! I especially appreciate the letter templates! This is brilliant! Thank you so much for providing the letter templates as well! This is one of my favorite stashbuster projects yet! This is great - thank-you!! I would like to make mine bigger & was wondering what font you used. Brilliant - and thank you for including letter templates in your tutorial! Debra--the font is Arial Black and is sized at 175 point. This is great! Fabulous idea! I need to try make a couple set for my little one and little one's friends. I love this. I have a quick question--why don't you sew the insides of the letters (P, B, etc) until after cutting? 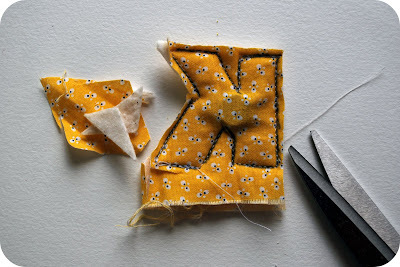 Fibercontent: I do not sew the inside of the letters until after I cut out the hole because they are small holes and are a challenge to cut out evenly from both side of the letter--and so it is easy to accidently cut through your seam when trying to cut it out. I learned this through inadvertently cutting through my seams several times when I initially tried to sew before cutting. Cutting out those little holes is the most challenging of the entire process--and not having to worry about a seam definitely takes the pressure off. Thanks Holly. That helps me. I do love this project and might take a stab at it this weekend. I appreciate the work you did on the tutorial. I've been thinking about doing a project like this for a while now, so it's helpful to see how you went about it. Very cute. This would make a great gift! I'm so impressed! What a great idea! Ive been wanting to make something like this for a while for my son who is learning how to read I was trying to figure out how to do it but seeing you do it and leaving the seams that way - well i love it im going to make him a set to start using to put words together i think ill make 2 sets and some extras, anyway THANKS!! I do pretty much most of my sewing from scraps. :>) I linked to this on my favorite scrap buster link roundup post - super cute!! (And I love the inexactitude of it - even if that isn't a word, it is now. That's my kind of stitchin') Thanks!! this looks like an amazing project!!! i can think of at least 5 christmas gifts that i could do this with and every single recipient (from my 4 year old neice to my daughter's preschool teacher) would LOVE them. about how long do you think it took you to make a set? also, do you have suggestions on where to find the magnets? i made some today! thanks for the rockin' tutorial! wonderful idea ! i'll make it for my 3 year old son, for his birthday ! thanks ! I bought the magents at Michael's. They were the small round magnets--like less than 1/4 inch in diameter. I would estimate from picking fabrics to tracing and cutting and sewing, it takes about 3 hours for 1 set. 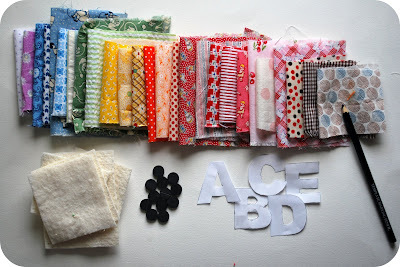 So many scraps, so little time! I love your site and idea! Adorable! I must make my grandkids names like this! Thanks for sharing. walllaaa, ishould try this...thanks for sharing dear! i love all yr works...so cute!! I loved this tutorial! I didn't make the whole alphabet-just the letters in my name, and I left out the magnets. I think I'll finish the alphabet later though! Thanks for posting it. This is so cute, and so much nicer than the plastic alphabet magnets. Another project on the list! I love these. I was wondering how much trouble you have with fraying since the ends are unfinished. I'm sure that's why you fray-stop as an option, but I'm thinking the little one I give this to might chew on them (no magnets!). Thanks! Desna--this is why I used fray stop--the way these are designed, there is not a lot of selvedge between the edge of the fabric and the actually seam. I know some people use basic elmer's glue as a way to stop fraying--and that is non-toxic (cannot vouch for how it will look--watering it down a bit may be a good idea). Otherwise, you could also zigzag around the edge of the letters and that will stop fraying--but doing that on letters this small might be a challenge so you might want to make the letters a little larger if that is your plan. Hope that helps. I'm in the middle of making these for my son's first birthday! Thanks so much for the tut. Ho my god it's so cut! I just found your blog and love everything you've done!! I'm going to make these for my daughter!! All the fabrics you use are awesome! where do you get your fabrics? Jenny--I buy my fabrics just about everywhere--Etsy, thrift stores, Joann's, Hancock Fabrics, some of my fave local places like Crafty Planet and Treadle Yard Goods...anywhere I can find fabric, I am probably buying something. Just saw this on pinterest...what a cute idea!! Love this idea!! I am all about inexactitudeness!! Holly - 2 things: my letters will end up about 1 3/4" tall. Is that about right? The ones in your photos look larger. Secondly, if I stitch really well wouldn't my letters be safe for little ones? I don't see how they could get a magnet out of it without cutting it which they won't be doing. Nina--they are about 2 inches tall once completed due to the tracing and the edge of fabric you leave around the seams once you cut them out--since you sew on the traced letter and do not cut the letter out right up to the sewn line. You could enlarge the template, of course, to make larger letter,if you wanted--but I suggest you experiment with one first to ensure the size of magnet you are using will support the larger letter size, since larger does mean heavier. As for the magnets--well, in theory, they should not be able to get at the magnet since it is sewn inside, but the seams are unfinished and if they were really really worked on, I suppose the seam could fray and the magnet could be released. I just make the statement about the magnets because they are very dangerous if you ingest them somehow and I would rather people be aware. That said, you know your own kiddos and what their typical behavior is with stuff so I would use this as your main guide. adorable. must have baby THEN must make! :) thank you for sharing. A lovely tutorial - thanks for posting! I've just finished mine (without magnets) and did stitch the apertures before cutting for neatness - it was tricky and I'd make them a bit bigger another time. I hope that you don't mind that I shared it in my blog today. Thank you for inspiration! I just finished a set of letters for my sons birthday. I made them bigger and just eyeballed the size by comparing them to each other. didn't use templates either. They turned out nice nevertheless. They are SO cute, but how did you sew these and keep the sewing machine needle from bending because it's attracted to the magnet? These are so great! I was google-searching natural alphabet magnets and came across this idea. They are beautiful and homemade and now I can't believe I almost bought those terrible plastic ones! Thanks! I am loving these! I am going to get my super crafty mother to make me two sets! I know she will love this idea! 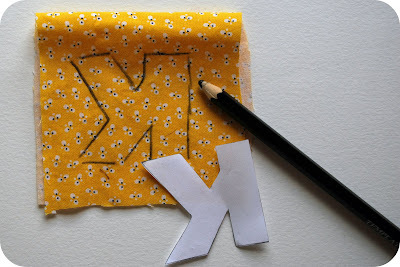 In your tutorial you say NOT to sew letters with openings in the middle until you cut them out first. That is SO HARD to do in such a small space, trying to keep the layers of fabric aligned. 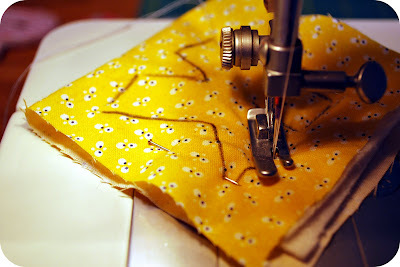 Better to sew around the openings - then, with small, sharp scissors, cut the fabric away. Just go slow and be careful. Thanks for the suggestion. I'll try it as Im doing 3 sets?? these look awesome!! thank you for the tutorial! you ROCK for giving us this tute! I love these! I attempted them, but did not have cotton to put inbetween so tried using fibre fill. I am a begginner sewer and had trouble since they were so small. My husband drew larger letters. I am currently working on them. I sewed the a and it worked. I do not have magnets so I am going to do the capital letters and lower case as one reader said she was going to do. Thank you for your tutorials I love them! I also did the number bean bags and bpthink they are so cute.. 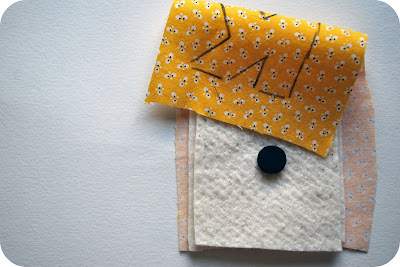 I LOVE this tutorial...and your blog! I am not a sewer, so instead, I traced the letters on fabric, and cut out with pinking shears. I also traced the letters onto cardboard, and cut those out with regular scissors. I cut a little bit inside the tracing on the cardboard, so the cardboard letters were a bit smaller than the fabric. The cardboard was layered in between the fabric, and I used fabric glue to keep everything together. I didn't add magnets inside, as I was a little worried about my toddler being able to undo the glue...if I had sewn, I totally would have used magnets, though! I came across this post about a year ago, purchased the supplies, and I have finally made it! Thank you so much!! I credited you in my blog https://nearlyfactotum.wordpress.com/wp-admin/post.php?post=578&action=edit and I hope this is okay, please let me know if I need to change anything. Thank you so much, we're thoroughly enjoying the letters!! Thank you so much for your post! I found your post about a year ago, bought the supplies and finally made it! I credited you on my blog at http://nearlyfactotum.wordpress.com/2013/04/04/magnet-letters/ Please let me know if I need to change it. Thank you so much, we are definitely enjoying the letters!! Just made a set of these 7.5" size letters for my granddaughter about to turn 1 year old. Just a thought about the magnets--I would leave an opening for the magnet and then hand sew closed. Magnets should not be that close to the machine. They can magnetize things they shouldn't, alter the working of the bobbin case. & if there is a computer component screen involved they can damage that. Thank you so much for this great idea. 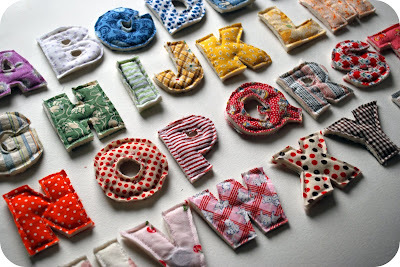 I have soooo much scrap material and I can even sew the letters after i make them onto the blankets I sew. I have been looking for a reason to use it all. Question, where can I get magents? You can get magnets from most craft stores...I bought mine at Michaels. Some are quite large but you can split them with a knife into smaller magnets. Good luck! I made a set! I love them, and my little girl loves them, too! Thanks for the awesome tutorial. P.S. I have a post about my set on my blog, and I link back to your post here. does anyone have a suggestion for a good font to use to make the lowercase letters? Do you have a set of lower cass letter templates? Came across this alphabet and fell in love with it. I made a set freehand for my 2 year old. Instead of cotton batting I used felt inside each one, just cut it with the fabric pieces for each letter. They turned out fantastic!! Thanks so much for the awesome idea! What size bag did you make to keep them in? Elizabeth, I think it was a 5x7 bag...or about that. Can't wait to make these for my great-grandson! What a wonderful teaching tool! Greetings from Swedem. I'm going to do this as a baptize-present for a little boy. It's both fun and learning so it is perfect! Just gave them a go...WOW! I am so please with how they turned out. Thank you! stupid question, why do i trace the letter backwards if i am not turning the piece inside out after sewing? Hi! I was looking to do this craft for a small Christmas gift, but I don't seem to see the PDF file that you used to have to print out for the letter size. I've had this pinned for ages - dunno why I never printed out the letters. Is the pdf still on your page and I'm just missing it somehow?? Help! So cute! Thank you for this wonderful tutorial! I recently made a set without magnets for my daughter and they turned out great! I also used pinking shears to cut out the letters to prevent fraying - I posted a photo of my finished set on my blog with a link to your tutorial!